Special Containment Procedures: SCP-XXXX must be kept in an airtight box made from either titanium or surgical-grade steel, fitted with a numeric keypad lock. Transport and analysis of SCP-XXXX must be supervised by at least one (1) staff member with Level 3 or higher clearance; testing of the object should be carried out only under the supervision of at least three (3) staff members with Level 3 or higher clearance, as well as five guards. All personnel who test SCP-XXXX must undergo psychological analysis before and after each test. 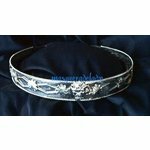 Description: SCP-XXXX is a circlet-style crown with inlayed images of thorny vines and the face of an as-yet unknown entity engraved on the front. The object is constructed of a metal that, upon first glance, appears to be either silver or pewter; chemical tests and analysis have shown that the object is comprised of a hybrid of the two metals, along witn an as-yet unknown third metal. When worn on the head of a figure of authority – either local/federal/national or self-proclaimed — SCP-XXXX causes all within audio/visual range of the wearer to develop an almost fanatical state of worship towards the wearer and/or any “higher power” the wearer proclaims belief in. Those under the influence of SCP-XXXX will refer to themselves as “brethren”, “chosen”, or “the children of” their chosen authority figure/deity, professing a profound belief in anything their “leader” proclaims and will go out of their way to accomplish any goals set before them, regardless of any potentially harmful or lethal consequences on their own behalf. The wearer of the object will then be able to control any and all individuals who consider themselves “brethren”, until a point in time where the wearer reveals that everything they have been told is a lie; this revelation will cause the “brethren “ to become confused until the wearer’s true intentions are explicitly revealed, usually by means of humiliating the “brethren”. At this time, it is unknown if affected persons are also considered susceptible to any orders, requests and/or commands of those considered allies of SCP-XXXX's wearer. SCP-XXXX also has the ability to make anyone under the influence of its wearer believe anything they are told, even if the statement is a complete impossibility. Such instances include females believing that they are actually males, single men being told that they have a wife and children, and mathematical paradoxes (2 + 2 = 5) sounding completely plausible. Unless the wearer of SCP-XXXX admits that the "fact" is, in fact, a lie, those under the influence of SCP-XXXX will continue to believe it as truth, refusing to accept any proof to the contrary. Furthermore, should the wearer of SCP-XXXX tell a lie that involves an impossible/improbable event (i.e., Elvis Presley performing a concert), the affected individual(s) will experience vivid audiovisual phenomena similar to hallucinations, with the addition of tactile sensation and tasting/smelling things that aren't really there. This property has led to SCP-XXXX acquiring the nickname, “The Crown of Lies”. SCP-XXXX was recovered from an abandoned warehouse in the city of ███ ██████, formerly used as a meeting place by a group known as the Order of Belphegor. Recovered documents and footage indicate that the wearer of the object was the “High Prophet of Belphegor”, the central authority figure of the group. The footage, recovered from CCTV cameras installed in the building at the recommendation of Agent Publius Enigma a month prior to the Order’s occupation of the building, depict the High Prophet using the object to control the “Chosen” during their gatherings, as evidenced by their voluntary donations of money, potential SCPs and even family members and friends. Handwritten documents, presumably from the “chosen”, describe the object “speaking” to individuals in their dreams, compelling them to serve the Order. As of 12/13/20██ , SCP-XXXX is contained at Site-19. Research will commence pending O5-level approval. Addendum: After Incident XXXX-01, it was discovered that SCP-XXXX has a limited ability to reanimate the body of a deceased individual previously under its thrall. The incident in question involved the corpse of one █████ █. ██████ attempting to strangle a morgue worker to death until its spine was severed by Agent Publius. This suggests that the object continues to manipulate those in its thrall as long as the brain is still viable; said manipulation will only cease when the brain stops functioning. As disturbing as this is, it’s not likely to cause any████████ ████–style outbreaks. The redneck was just a test subject, sent in to see just how powerful the crown was. Since we recovered SCP-XXXX a week after the incident anyways, I don’t think we’ll need to worry about any more dead guys attacking us. – Agent P.E. Note: I’m filing a suggestion that the lock be changed to a biometric thumbprint scanner; keypad locks are too easy to confuse – not to mention their susceptibility to pyrbars and screwdrivers. – Agent P. E.